As promised yesterday, here is the first post of the Cookbook Casting Call series and the first menu planned from the book. 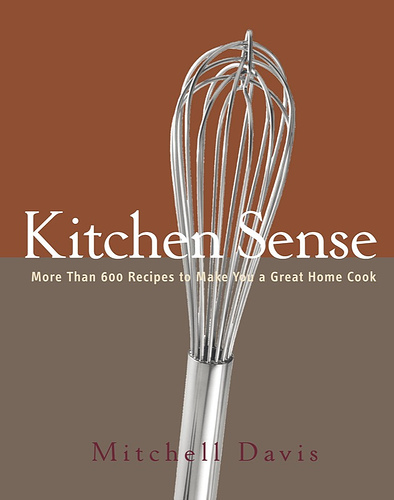 Back in 2006 I was asked by Cathy at A Blithe Palate to take part in a Cookbook Spotlight for Mitchell Davis' fine book, Kitchen Sense: More than 600 Recipes to Make You a Great Home Cook. Since then I've made a few more recipes from this book, including memorizing the recipe for Deep Dark Chocolate Frosting. All the recipes I've made have turned out quite wonderful and I don't have any complaints with the exception that a beginning cook may find the lack of any pictures or diagrams disconcerting. Otherwise, it is a pretty solid general cookbook. Items from Kitchen Sense are marked by an *. Also, I have the same thing for breakfast every day: 1 cup plain yogurt with a 1/2 a cup of fresh fruit and a 1/2 of cup of honey granola. The only day I don't have this for breakfast is Saturday when I either have one brown sugar Pop Tart or treat myself to pancakes at a diner in town. So, there is no breakfast on the menu. I think that menu should put Kitchen Sense to a good final test and the menu also adheres to the Pantry Plan as I have all the ingredients for these dishes already on hand. and used some left over chopped onion and half a bag of baby carrots that were about to go bad. I left out the celery and kale called for the recipe as written because I didn't have either on hand. I also used up a box of my favorite commercial chicken stock I had in the fridge that I had just opened last week for just 2 Tbsp. Again, this wasn't in the original recipe but I didn't want the chicken stock to be wasted. 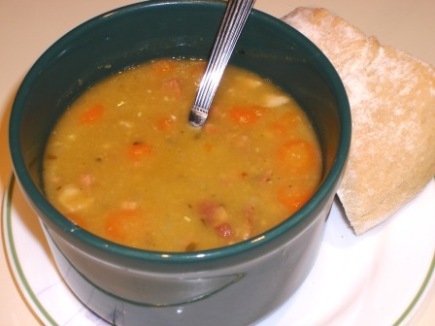 Otherwise, I followed the recipe and it made enough that I was able to freeze about one quart for later this winter! In a large stock pot, heat the oil over medium high heat until shimmering. Add the onion and saute until soft. Add in garlic and cook for 30 seconds. Add in carrots, ham bone and ham, bay leaf, thyme, kosher salt and ground pepper and stir. Add in peas, chicken stock, and water and bring to boil. Reduce heat and simmer for 2 hours, stirring occasionally. 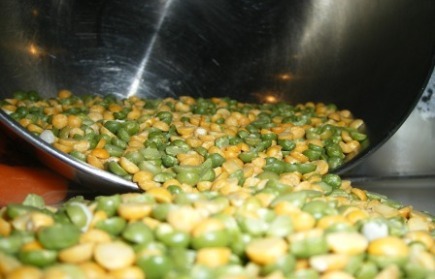 Continue to cook on low heat until peas break down when stirred vigorously, about another hour. Serve with crusty bread and small salad.